In order to bring an improved service to our users, we started working with companies in various industries to create a platform that would allow for better flexibility while keeping the Teambition experience simple. The fruit of this initiative is a rebranded ‘Spaces’ tab, a Power-ups platform, and a new pricing scheme, all of which are available today. You might have already noticed that we renamed ‘Projects’ to ‘Spaces’. This is part of our ongoing efforts to make Teambition more consistent with how you use it every day. The word ‘Spaces’ represents Teambition’s positioning as a brand, that it adapts to any way of working you choose while remaining simple and intuitive. Next up in order to respond to our users’ increasing need for flexibility, we are proud today to release the Teambition Power-ups. These are extensions that users can enable in a Teambition Enterprise organization to add complementary features developed by third-parties. They allow you to complement Teambition in a context where you need an additional layer of customization. Our platform will also allow companies and third-party developers to create more power-ups if the ones they are looking for are not presently available. To navigate, simply click on the ‘Power-ups’ button under Space Menu. There currently are 5 applications as well as 8 extensions on our platform, among which there are Weibo, Github and Evernote. You can now write a post with Markdown, link up your code on Github, or start a video chat with your team. Also keep tuned for our next version of extension platform that empowers you with more features and better customization. 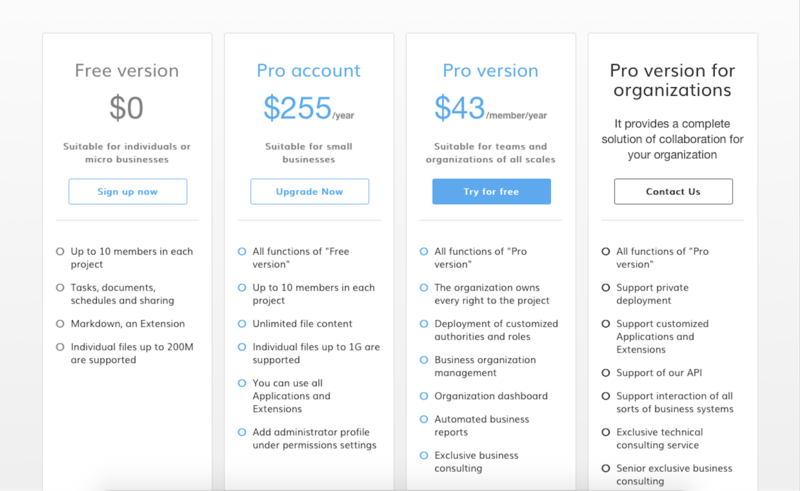 Our new pricing is now meant for free users who need a simple experience, our Pro plan which provides more features for professionals and small businesses, and an Enterprise version meant for bigger established companies. 1. Gift from us: For those who registered before 22:00 May 17th 2016, you are entitled to create spaces with no limitation on the number of members, on top of getting our Pro version free of charge for 6 months. 2. CRS Plan: For all NGOs as well as student organizations, you will continue to enjoy free accounts of either our Pro or Enterprise plans. 3. Startups: For startups under our partner incubators, you will continue to enjoy the discount to upgrade to Pro and Enterprise plans. It will not be long before Teambition celebrates our 3-year Anniversary in June. With more than a hundred employees and over one million users, we look forward to the great things your team will achieve using our platform and services.